Bleublancrouge created a stunt on Facebook for Opinel knives. Using an app called Picscatter, various images (carrot, cucumber, sausage and leek) were “chopped” and Facebook user’s were then tagged. The effect was a large chopped image across the top of the user’s profile page. These images were then be published on the Opinel Canada fan page, with instructions on how their friends could also chop up fresh new profiles pictures. 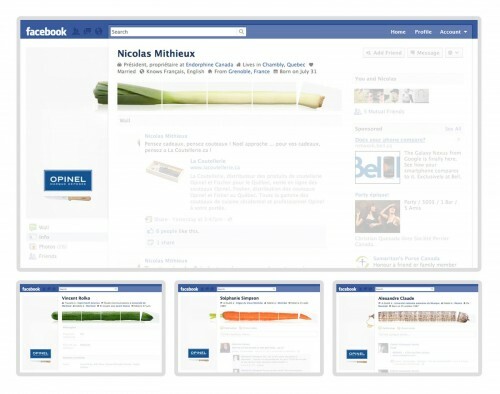 The Online Advert titled Chopped profile pictures was done by Bleublancrouge advertising agency for product: Opinel Knives (brand: Opinel) in Canada.